Wednesday, I was at the RH at the Andaz West Hollywood. I've heard of the Andaz because of Blogger Prom back in February, the event I missed out on. Long story short, I was invited back to dine at the RH along with my boss. Starters: Shrimp ceviche (that's SAY-VEE-CHAY, Jennifer of Top Chef), not that thrilled about. 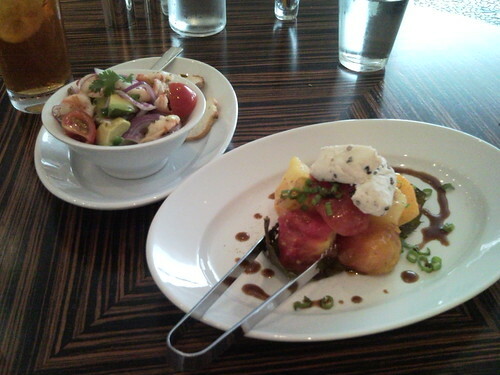 Heirloom tomatoes salad with local goat cheese...oh my god good. Talk about things in season tastes best! 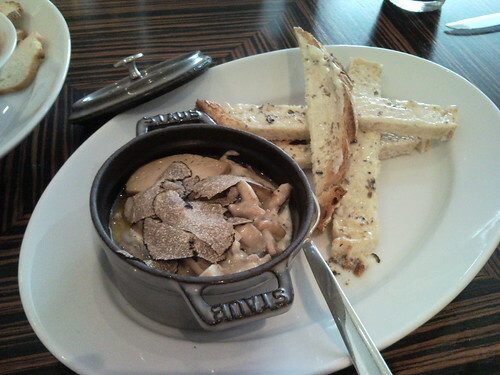 But there was the Peregordine egg which is fois gras topped with poached egg and sauteed mushrooms topped with truffle with truffle buttered toasts for dunking. I had to pinch myself as to how good that was. Actually I tweeted that I would bathe in it. @davidmoyle joked back that it would make an interesting shoot. I told him if the Andaz would give me a bath tub full of it, he could totally shoot me. It's that good. Oh god, I'm drooling thinking about that. Main courses brought me the scallop daily special with roasted summer veggies. Perfectly cooked as everything was, it didn't blow my mind. 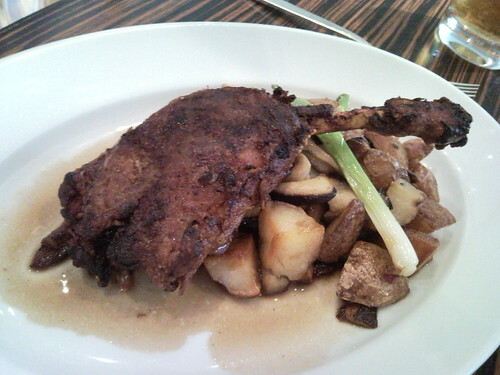 Nhien's order of duck confit, however, it was as good as Irene Virbila of LA Times says. She gave me a couple of bites to taste in exchange for one of my scallops. Crispy skin. Moist, delicious, tender meat. We topped off with blood orange sorbet, a crisp, clean, and refreshing day to end the meal. The pear tart I have heard so much about just had to wait another day as I couldn't even find room for it. On Friday, I finally made my way to the much celebrated Bottega Louie in Downtown LA. We were not disappointed...much. Well, I really wish there were more flavors for the Italian sodas. But that's just me. Portabello fries with herb aioli? Good lord, why didn't WE think of that?! A coworker ordered magherita pizza which wasn't bad but I didn't jump up and down for it. Neither did I for the Ceasar salad my boss ordered. 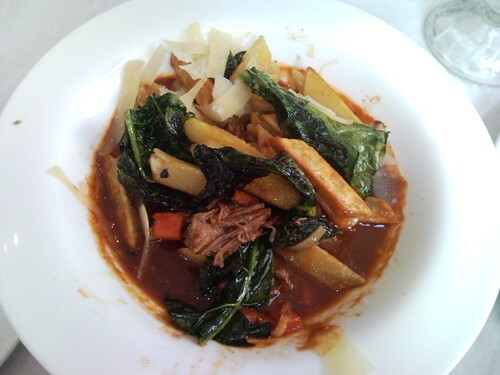 However, my Trenne (pen shaped) pasta, braised New York steak with kale, surprised me. The pasta was toasted up crispy. Yes, the perfectly al dente pasta with a crispy edge. It looked like fries at first sight. And boy, the textures were perfect altogether. Out of the ballpark, this dish. We couldn't walk out of the place without checking in on the dessert counter. 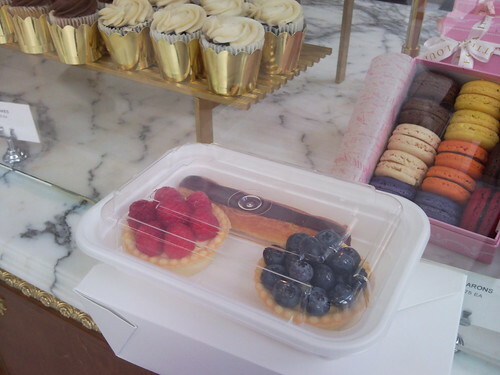 The back holds the "cold" stuff like the bitty fruit tarts, creme brulee looking tarts, and the eclairs. The front by the door as the colorful (and quite tasty, as we discovered) macaroons and cupcakes. Thank GOD Bottega Louie wasn't closer to the office. I would break my back eating there everyday. Seriously. ETA: For the price, I would definitely say the RH gives me more bang for the bucks. That quality, yummy food in the super sleek setting? You would've thought it would break your bank, but it doesn't. VERY reasonable. Bottega Louie is a toss for me value wise. Did I feel like I got $15 worth out of my pasta? Yes, I did. $2 for the bitty fruit tarts? Yes, of course. But, I felt like I was paying a lot more for the meal than I did at the RH. Just sayin'.